These family pictures were taken on super pod day, when several pods of orca whales had congregated together. During super pod days as many as 100-150 whales can be seen all from various killer whale pods. 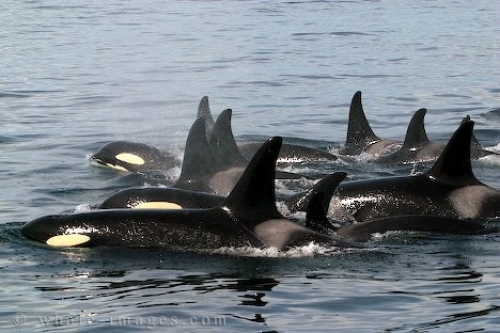 Sometimes Killer whales will get together to help hunt or just to socialize. These family pictures were taken while several pods had come together, and were traveling in the same direction. Picture of a large Killer Whale family on superpod day off Northern Vancouver Island, Canada.